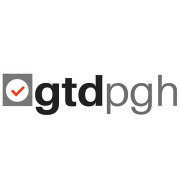 Getting Things Done Pittsburgh (GTD PGH) Productivity Group is a community of local personal productivity enthusiasts who enjoy discussing and sharing ideas/resources centering on David Allen's work, started with his well-regarded book on personal productivity, Getting Things Done®, in and around the Pittsburgh, Pennsylvania metropolitan area. It's that simple! 4) providing an online platform to connect outside of our monthly meetups about your ideas, challenges, SUCCESSES, and more with GTD. Once a quarter (and sometimes more often) we host seminars and workshops by GTD experts to teach Beginner, Intermediate and Advanced level material to members interested in growing in their GTD practice. If you have ever thought, "I could be more productive." Or, "I need to stop procrastinating on major goals in my life." Or, "Where did all this clutter come from?" you're a good candidate for this Meetup. If you have read David Allen's materials, or even tried to implement GTD into your life, work or personal, join us. If you are a GTD black belt ninja and would like to share your GTD skills and knowledge with others. Well, this is the Meetup for you too! Our meetups are posted on the meetup site as scheduled, so check the main page often to see when they're announced! If you have any questions, please message Ray Sidney-Smith, the Founder/Meetup Organizer.